The perfume brand started out as a dinner-party gift and now boasts sales of about 10m bottles per year. The design of the Chanel No 5 bottle has remained a timeless classic, since the variant was created in 1921 as a modern contrast to the other perfumes of the early 20th century. The French socialite and clothing designer, Gabrielle 'Coco' Chanel, asked the perfumer Ernest Beaux to create a scent that embodied the modern, unconventional woman. Chanel initially gave the No 5 perfume bottles to close friends at a dinner, before the perfume went on general sale the following year. The fragrance chiefly comprised rose, ylang-ylang, jasmine and sandalwood. The inclusion of aldehydes (compounds formed by the partial oxidation of alcohols) created a fresh and lasting synthetic scent. Enclosed in a transparent, crystal bottle, the amber liquid became the focal point of the product's design. The clean-cut vessel, with its rectangular shape and rounded shoulders, was a contrast to the ornate art deco-style bottles of the early 1900s. The design was said to be based on a whisky decanter used by Chanel's lover, Arthur 'Boy' Capel. The black and white label complemented the functionality of the bottle and the perfume, in line with the simplicity and comfort of the hats and clothes Chanel had been creating since establishing her millinery shop in 1910. 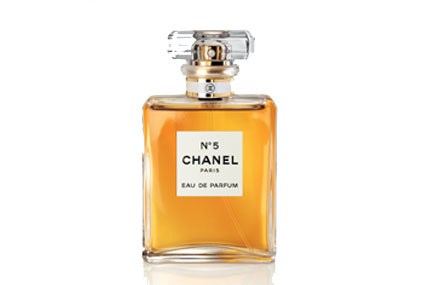 Chanel No 5 proved popular with the public when it was launched in 1922 and was soon released in the US. The glass bottle was too thin for shipping and distribution, so its corners were altered from a rounded to square shape for export. Chanel required the necessary investment capital and business expertise to support expansion beyond Europe. She entered a partnership with two businessmen, the Wertheimer brothers, and together they established the Parfums Chanel Company, with Chanel retaining a 10% share of the business. Although it is now in its 90th year of production, the current bottle barely differs from its original design. The company has always worked hard to retain the perfume's aspirational status. In 1934, the pocket flacon, a smaller-sized bottle, was created to reach the middle-class customers. In 1974, when the perfume ran the risk of becoming a mass-market product, Alain Wertheimer reduced sales outlets from 18,000 to 12,000, removing the bottle from drug stores in the US. As soon as No 5 was less readily available, it was in far higher demand, and sales have remained strong as a result. Chanel No 5 remains successful today, with about 10m bottles sold worldwide every year. Extravagant campaigns have featured a range of celebrities. Marilyn Monroe is famously quoted as saying that she wore five drops of Chanel No 5 to bed. In more recent times, Nicole Kidman starred in film director Baz Luhrmann's movie-like ad, while Brad Pitt is one of the contemporary faces of the brand. What can we learn from this? What can't we? No 5's design epitomises the holy grail of 'timeless classic'. With its understated, form-follows-function glass bottle, sensitively embellished with an oversized stopper and undersized seal, Chanel sets the standard for the exercise of restraint. In perfect harmony, the elegance of the mirrored C hallmark and its seamless connection to a simple, bold 'CHANEL' elevate No 5 to a thing of such beauty it 'feels like winning the lottery' to possess one. It also provided inspiration to students of design for four generations. Simplicity is the ultimate sophistication, but great design, no matter how seductive, cannot be responsible for such commercial success by itself. Gabrielle 'Coco' Chanel may have created the first designer fragrance, but she wasn't just a pretty face. From the discreet seeding of the product among elite customers of her clothing boutiques, to the carefully controlled distribution and enrolment of enthusiastic sales assistants to her cause, her work on No 5 is a text-book example of building a luxury brand by word of mouth, managing supply just behind demand, a case of using pull rather than push. To thrive in the novelty-obsessed fragrance market for a decade is to be considered a survivor; to do so for 90 years, however, makes No 5 a rare breed indeed. 1910: Gabrielle 'Coco' Chanel set up a millinery boutique, Chanel Modes. 1921: Ernest Beaux presented her with a choice of a series of fragrances, numbered from one to five and 20 to 24. She picked No 5. 1924: The company was renamed 'Parfums Chanel' when Chanel entered a partnership with the Wertheimer brothers. 1934: The more affordable flacon container was released to engage with the middle-class market. 1954: Marilyn Monroe said that all she wore to bed was Chanel No 5, subsequently boosting sales. 1959: A bottle of Chanel No 5 was included in the permanent collection of the Museum of Modern Art in New York. 2012: Brad Pitt was named the new face of Chanel No 5, the first time a man has represented the fragrance.